May, of course, is full of events. Mother’s Day is sneaking up on us, and the round of graduation parties is edging toward us. It’s also a great time of year for someone who loves to eat. The asparagus is out in quantity, there are strawberries that smell like strawberries, and you can eat your fill of spinach and peas. Thanks to the Master Gardener Leader, we’ll have plenty of herbs to sample and play with. Oregano plants will be available for those interested in starting their own. Hope to see you there! Recent events have been going well, despite a lack of publicity by me! I had a lovely tasting at Taylor Books in Charleston, WV last weekend with an enthusiastic audience, and several nutrition talks have been well-attended. A future event at Taylor Books may happen later this summer… let us know if you have any thoughts. My series with the Roane County Libraries continues. Check out the next event, “Cooking with Spring Vegetables,” at the Spencer Public Library on Tuesday, April 17 (12:00 to 1:00 pm). We’ll be demo’ing a few good uses of sugar snap peas, spinach, and pea shoots. Cooking demos and tasting will also be presented through the Master Gardeners monthly talks in May, June, and potentially July. Presented by the Extension Service, Master Gardener events are open to the public as well as those who have completed the course or are interested in taking the course. Keep in touch (Twitter: StephanieBostic) for updates! While the traditional American Thanksgiving revolves around a giant bird, there’s no reason not to just eat whatever makes you happy (within reason, of course). Indian food is a popular option among non-traditionalists, but you can even sit down to the perfect grilled cheese with steamed vegetables. Braise a few root vegetables, and eat an egg. Make a pot of soup, a pumpkin custard, or bake an apple. I think we even had Chinese food one year when I was growing up. If you want a traditional meal, but aren’t hosting or visiting elsewhere, I’d suggest a roasted cornish hen with baked sweet potato (or turnips? cauliflower? ), roasted brussels sprouts or green beans, and either a baked apple or individual pumpkin custard. Gravy is optional, and a good piece of bread or some stuffing can fill in any empty corners. Whatever your plate holds, pause and eat consciously– whether in joy because you grew enough food to (hopefully) survive the winter, in hope that the following year will be better, with great love for family and friends, or for any other reason. Maybe you are thankful your dog finally stopped eating your shoes, or your closest friend found a needed job, your country is not at war, or your grandchildren actually called. Breath, think, and enjoy! I’m not really a fan of them. When you’re cooking your own food, and have a good sense of hunger and satisfaction, you shouldn’t need them unless you are on a prescribed diet. From the aspects of accuracy to the vagaries of your own metabolism, there are many factors that significantly skew their utility into oblivion. With packaged and (some) restaurant food, there are numbers available. Are those numbers accurate? No. Everyone is always horrified, but when students and researchers go buy food and then burn it in a calorimeter (to determine the actual number of calories), they don’t match. “Not matching” can be by 5%, 10%, or by 40%. Using inaccurate numbers to determine your daily intake is counterproductive when they may be telling you that you are eating far less (or maybe even more) than you actually are. Unsurprisingly, whole foods vary quite a lot naturally… one pig may be leaner than another while one plum has more sugar than another. 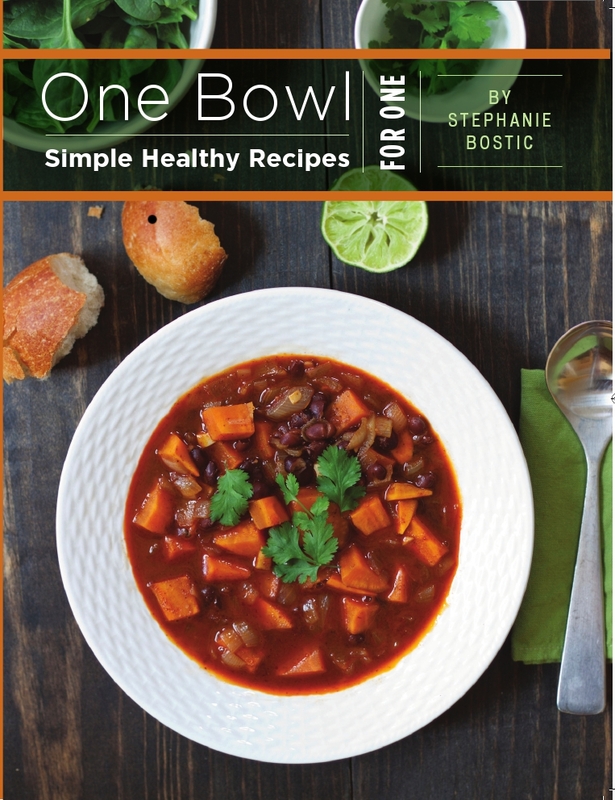 Listen to a live conversation from last night with Cyrus Webb, of Conversations Live, at BlogTalkRadio, and the author of One Bowl. Have other questions for the author? Leave them in the comments section. Myth: You can’t make soup for one person. Busted! Many soups work very well in single portions, the exception being some very long-cooking stews where it is simply impractical (and very energy inefficient!) to cook one bowl’s worth for 4 fours. Try making a quick vegetable soup, lentil or bean soup, chicken soup, or miso soup. The trick to keeping your portion under control is fitting your ingredients into a 2-cup measuring cup or bowl, then adding just enough broth/water/tomato sauce to fill in the cracks. Don’t overflow it, and you’ll have just one bowl. Some ingredients do shrink, like onions and greens, or expand more, like rice and lentils, as they cook than other, but the 2 cup rule tends to work fairly well as long as you have a mixture of ingredients. Then, of course, you add your herbs/spices and liquids. Need to cook it quickly? Save your leftover cooked vegetables and grains to add to broth along with an egg or canned beans. Herbs and spices are optional, but delicious. 10 minutes = homemade soup, just for you. Herbs and spices can seem somewhat mysterious– what complements which foods and which seasonings highlight each other? When and how do you add them? One Bowl helps demystify them via a handy chart listing some common uses. Beyond matching the foods, though, the timing of seasoning can dramatically impact the flavor of the dish. 1) Heat dried herbs and spices, in oil or fat, if possible. Many of the compounds that create the wonderful taste and scent of seasonings are soluble in oil, so it distributes the flavor evenly. Toasting them without fat also helps– it removes the “raw” flavor that many herbs and spices can have and intensifies different flavors. 2) Add dried herbs and spices toward the beginning of the cooking time to maximize the amount of the flavor released into the dish. 3) Add fresh herbs toward the end of the cooking time to maximize their fresh flavor. 4) Crush dried and fresh herbs before adding them to a dish to release the flavorful oils. There are, of course, exceptions to every rule. When in doubt, start with these.